Tom also has represented clients in condemnation cases ranging from the taking of property for highway and road purposes to high voltage transmission lines and gas pipelines. Tom has extensive jury trial experience, having tried over 100 cases to verdict. 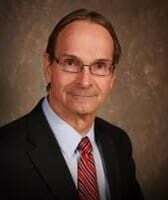 Tom also has broad appellate experience, having argued before the Wisconsin Supreme Court and the Sixth and Seventh Circuits of the United States Court of Appeals. Tom’s legal and trial abilities have been recognized by his peers. He has maintained the prestigious AV rating from Martindale-Hubbell for over 25 years. He was elected a Fellow of the American College of Trial Lawyers and a Fellow of the Wisconsin Law Foundation. Tom is listed in the Best Lawyers in America, Wisconsin Top Lawyers, and Wisconsin’s Super Lawyers. He is admitted to practice before the United States Court of Military Justice, the United States Supreme Court, the Wisconsin Supreme Court, the Eastern and Western Federal District Courts of Wisconsin, the Sixth and Seventh Circuits of the United States Courts of Appeals, as well as the United States Court of Appeals for the Federal Circuit. Tom is a lifelong resident of Wausau and is an active member of the local community. He is also Chairman of the Board of Marathon Savings Bank.